In a democracy, people choose their leaders and hold them accountable for their policies and its efficient implementation. In the past, the leaders of the political parties who aspired to be policy makers in a subsequent government they were to form, drafted ‘party manifestos’ in a hurry without due consideration to ‘evidence-based policy formulation’. As for effectiveness of those policies and implementation, it is interesting to find out answers as to why our Government ministries and institutions failed in policy implementation? The answer narrows down to one single entity, which is non-other than the government machinery itself and the ill-conceived process of its policy formulation. As far as the Government machinery is concerned, it goes without saying that the Leader of the Government should play a major role in the decision-making process for the successful implementation of policies for the benefit of the people and society at large. This real leadership comes from an honourable character and principles. There is increasing pressure on policymakers to develop more effective policies to manage the resources more efficiently and effectively. This will result in improved implementation and outcomes. It is the premise that better policies and better decision-making are seen when they are based on sound empirical evidence and solid rational analysis. Evidence-Based Policy Making and Implementation (EBPM&I) supports not only establishing objective evidence as a key informant of policy, but also improve implementation of public service. In addition to data, understanding the current policy and the decision-making processes are important elements of this research. Tools used for this purpose could include; qualitative and quantitative research, empirical research, pilot projects and reflections, stakeholder engagements, expert input, case studies/diaries/photographic stories, autobiographies, evaluations, impact assessments and appraisals, etc. Successive governments have failed in bringing social justice and much-needed economic welfare to the people. Consequently, the income inequality and social unrest have escalated across the regions, sub-districts and cities. Most of the top business leaders and professionals are of the view that the quality of life, not only poor but even the middle class is drastically reducing. The immediate future scenario would be for more and more people be dissatisfied with the Government machinery and its leaders. Therefore, in our view, time is opportune for academics, professionals and business leaders to come forward and critically review the national policies, programs and their implementation processes. 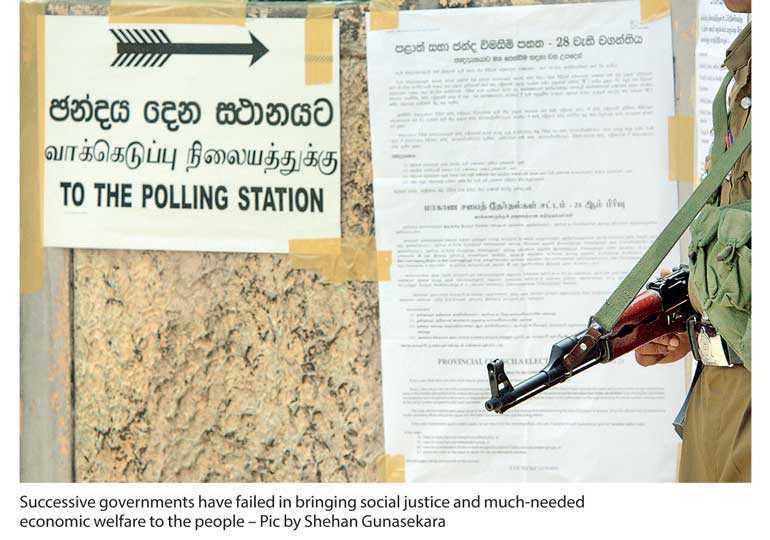 They should engage in developing ‘winning strategies’ for Sri Lanka based on evidence and past experiences (lessons learnt), without having fixed ideologies linked to petty party politics and affiliations. As per Stephen R. Covey, Author of the ‘7 Habits of Highly Effective People,’ the real leadership power comes from an honourable character and from the exercise of certain power tools and principles. According to Covey, followers follow; (a) out of fear (coercive power) (b) because of the expected benefits (utility power) and (c) because, some people tend to believe in them and in what they are trying to accomplish. (This is called legitimate power). In “c” above, they are trusted and respected and, they are honoured. The followers want to believe in them and their cause. This is not blind faith; this is knowledgeable and wholehearted commitment demonstrated by the followers. According to Gotabaya Rajapaksa, Chairman of ‘Viyathmaga’, the methodology for conducting studies covering different sub-sectors for policy analysis and formulation should be based on the above methodology thus following the correct process. The ‘Vm’ mission provides a common forum for its professionals and academics to work as a team to mobilise the expertise and practical knowledge of members to critically review existing policies and programs. This process enables a number of different project teams to develop appropriate policies and strategies for each and every sub-sectors, which would eventually influence the decision making of the next government for greater good of the society. At these deliberations, when participants express their opinions as professionals, they also listen and eventually agree to the views of the other academics, fellow professionals and other members representing their own districts, even though they initially disagree with their views and suggestions. There is a multi-disciplinary approach to the composition of the project teams focusing on specific subject areas, for an example; ‘the education reforms team’ includes eminent educationalists and academics, business leaders from the corporate world, university students, experts on vocational training institutions, etc. They are involved in the process and able to critically review existing policies and programs. This process is conducted in a systematic and more structured way and the draft presentations are carried forward to the next level of discussion forums before finalising the reports. If we are to truly fast-track development initiatives to improve the economic welfare of the people of this country, this would be the way forward. It goes without saying that this is a more democratic way of undertaking policy reviews, thus leading to a serious public policy formulation as opposed to a more authoritarian style of policy formulation and execution done in the past and even practice today under the present Government. True democratic principles, if practiced in a more efficient and effective way, will truly benefit the people at large. One need not re-define democracy, instead reorient himself/herself to understand which system of governance is more democratic.